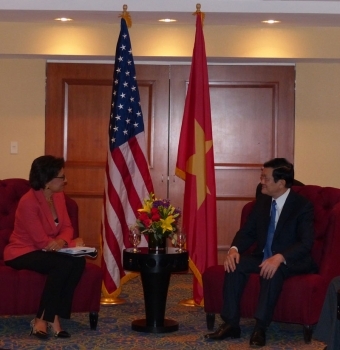 U.S. Secretary of Commerce Penny Pritzker today met with President Truong Tan Sang of the Socialist Republic of Vietnam. President Sang is the second Vietnamese president to visit the United States since the normalization of diplomatic relations 18 years ago. Under Secretary for International Trade Francisco Sanchez, Assistant Secretary for Import Administration Paul Piquado, Deputy Assistant Secretary for Asia Craig Allen, and Vietnamese Minister of Industry and Trade Vu Huy Hoang were among other meeting participants. 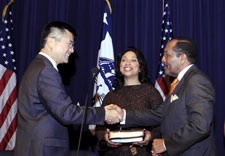 Since the 2001 U.S.-Vietnam Bilateral Trade Agreement went into effect and Vietnam joined the World Trade Organization in 2007, commerce between Vietnam and the United States has thrived. Secretary Pritzker highlighted that Vietnam has made significant progress on its economic reforms, which have contributed to its economic growth over the past decade. The secretary also talked about how our bilateral trade relationship continues to grow each year, with U.S. exports to Vietnam up 22 percent in May 2013 compared to the same period last year, and imports from Vietnam up 16 percent. Secretary Pritzker also emphasized the importance of concluding the Trans-Pacific Partnership (TPP) trade negotiations this year, which is a top priority for the Obama administration. With Japan’s entry at the end of July, the 12 TPP countries will account for nearly 40 percent of global GDP. The secretary affirmed to President Sang the U.S. commitment to working closely with Vietnam to reach consensus on the TPP countries’ shared vision for a comprehensive, 21st century trade and investment agreement. Vietnam has a significant amount to gain from this agreement, particularly when it comes to increasing its exports. The country currently exports $95.5 billion in goods and services, of which nearly $17 billion is to the United States. The secretary also expressed our commitment to working with Vietnam on reciprocal market access of goods and services. Lastly, Secretary Pritzker and President Sang discussed Vietnam’s civil nuclear and renewable energy sectors, which are priorities for the country. Ensuring Vietnam has access to the very best of American industry will help support both countries’ economies.